Photos by Dominik Dycewicz The first time I managed to watch Three Trapped Tigers live was not â as Iâd imagined â in some sweaty, beer-stained basement, but in the rolling green fields of 2000 Trees Festival. After strings of TTT tours that always found me in the wrong city on the wrong night, last yearâs Cheltenham-based festival seemingly played host to every band I had wanted to see live that year, but hadnât managed to â with Vessels, Errors and And So I Watch You From Afar amongst them, and Three Trapped Tigers right at the top of my crumpled programme. Tonightâs performance is a tighter, more intimate affair than the last time I saw the band storm a stage. Devoid of Wellington boots, plastic cups of warm cider and intermittent bursts between rain and skin-burning sunshine, tonight Hamptons plays host to a night of electronic eclecticism and naturally positions Three Trapped Tigers just centimetres from their captive audience, a move that already places this performance into a more personable range than that of a typical festival set up. But before Three Trapped Tigers can unleash their sonic experiments upon their eager viewers, Bleiki take to the stage for what they announce is their first ever live show. Consisting of just a drummer and a one-man laptop operator, Bleiki successfully combine projected words and images to produce an interesting set that tests their listenersâ senses. 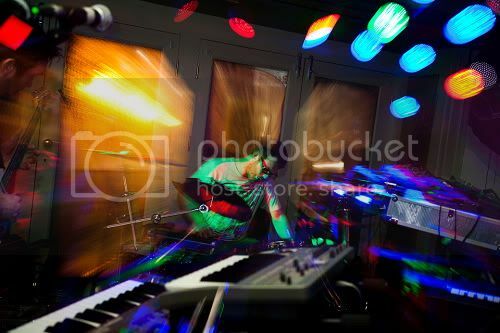 The duo is clearly enjoying themselves, and so they should considering that the audience seem captivated not only by the moving images on the widescreen TV that stands imposingly on the stage, but also the sounds that the pair manipulate through loop pedals and laptop-generated pre-recordings. One such moment comes when Bleikiâs electronics expert explains that a particular songâs accompanying on-screen images were drawn by his autistic brother and that the song is about him. Combining the two, and within the explanatory context, the images take on a whole new meaning, and those that can crane their necks to catch a glimpse of the assortment of drawings on stage as the electronic meanderings thump and thud around them certainly seem impressed by the duoâs showmanship and the amount of effort that must have gone into executing such a seamless production. For their first performance, Bleiki more than hold their own against the electronic experimentalists that the audience are here to watch. Yet nothing can quite compare to the evident interest drumming up around the graphitised walls of the room as Three Trapped Tigers set up in the wake of Bleikiâs departure. Taking to the stage in silence the south-London trio plunge straight into a quick-fire medley of unheard material. Three Trapped Tigers are a band of very few words, preferring to allow their music to speak for itself. Not only does this manifest itself in the bandâs apparent lack of stage banter, but also in the industrial, instrumental nature of their material. As such lyrics are few and far between, with the occasional harmonies of âAhâ from keyboardist Tom Rogerson and guitarist Matt Calvert being enough to satisfy any vocal cravings that the band might harbour. This is a characteristic that has also lent itself to the bandâs newer material, showing a level of continuity across their releases, where, based on this showcase of these songs, change and development has otherwise been at the fore. After half an hour of non-stop playing, the band pause for breath, and Tom confirms that the last five songs that have made up the entirety of their set so far are all songs that comprise the partial tracklisting of the bandâs debut album Route One Or Die that has been set for release in May. From this display alone it is clear to see the progression and patterns of new musical direction that the band have taken since the releases of their three EPs to date, and the audienceâs keenness to warm to songs they havenât heard before is proof of the bandâs long-standing knack for creating intriguing melodies and riffs that bristle with energy on stage. From hereon in Tom announces that the further tracks played will be a little more familiar and with that Matt signals the alternating numbers six and seven over to both Tom and drummer Adam Betts in quick succession, complete with a look of mild confusion. For those in the know, these signals indicate more than pure set-list sign language, as their previous material features song titles with simple numerical titles from â1â to â11â. Yet with this mathematical display in action, thereâs a sense that these numbers are used for necessity and practicality rather than a collective lack of imagination, as their songsâ melodic twists and turns exemplify. But what Three Trapped Tigers lack in the titular confusion and conundrums that many of their industrial counterparts relish, they make up for with their swooping on-stage synchronicity. There are no triggers and no samples or loop pedals used on stage, rather all the music is created entirely on stage with their own instruments. 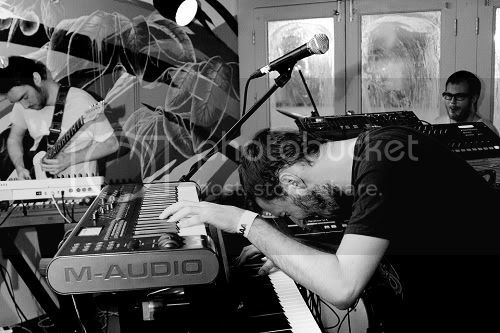 In this way Three Trapped Tigers demonstrate that they are very much a live band in every sense, preferring to keep the on-stage incarnation of the band as a trio of keys, synths, drums and a singular guitar rather than relying on loops to give them a bigger sound. Not that they need it â indeed the three more than prove that individually theyâre all hugely talented musicians, both on recordings and in a live setting, and the sweat-soaked walls and steam-ridden windows are testament to their energy on stage and the fervency of their audiencesâ reactions to their music. As Three Trapped Tigersâ set draws to an end, thereâs a slight sense of disappointment that only two of their currently released, familiar tracks are played tonight, but the fact that the majority of the eveningâs set list consists of a sneak preview of the bandâs long-awaited debut long-player is a detail that is hard to begrudge. And based on the level of skill and progression of the songs displayed during tonightâs 45-minute show, May and the release of Route One Or Die cannot come quick enough.